Think about your favorite sport . . . Assuming that running is a component of that sport, how often are the athletes in a situation that allows them to run, unobstructed, straight ahead for more than 20 yards? No other people to encounter. No pivotal piece of equipment that forces them to adjust their line. Unless your favorite sport is track and field or swimming, this scenario is a real situation that must be negotiated, play after play. Perhaps a wide out or kick returner breaking for a touchdown is one case, but that happens only once or twice a game. Theoretically, a baseball player legging out a grounder in baseball counts as well. 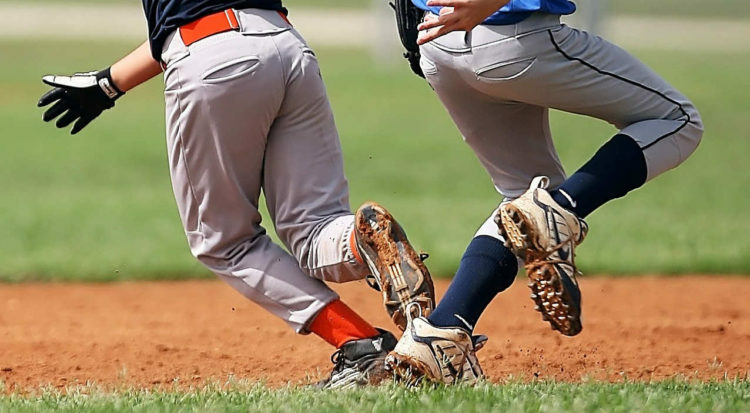 But even in both of these situations, there were adjustments in either the route run, and the surge out of the batter’s box that forced the athlete to negotiate changing their running line to find an optimal “opening” to burst forward without limitations to their path. Change of direction speed, the ability to adjust the running line efficiently, without major drop off of effort, is a symphony of what feels like a dozen factors coming together seamlessly to display athleticism. In my lifetime, I have only seen three athletes who were able to break all of the “rules” of running and still mesmerize the crowd with grace and precision. We are all fortunate to watch Russel Westbrook dominate the floor, regardless of which floor he’s on (and regardless of who is on that floor with him). If you watch what he does, many of his “scratch your head plays” stem from something that defies not only gravity, but also the “rules” of disciplined movement. I watch him with my mouth wide open every time he plays because he defies all the laws of physics by doing things that are fundamentally unorthodox. What he has done this season is nothing short of amazing and if he’s not the MVP for the NBA this year, I will be physically sick. The second is Barry Sanders. Need I go into why he is on this short list? The only other athlete I have seen who had that type of ability was a young man named Darryl Jones. DJ played for me at Cal Poly in the early 2000s and was one of the most naturally gifted human beings I have ever seen. Again, an athlete who was born with such an advanced sense of balance, a superhuman-level understanding of footwork and a God-given gift of raw speed. DJ never “needed” me. He had all the tools at the moment of conception. He picked the right parents. 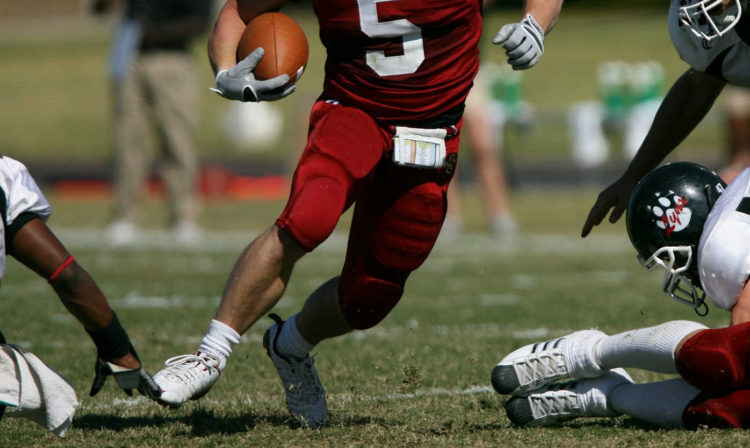 His senior year, he returned a punt that to this day, is the most amazing football play my eyes have ever seen. NFL, college, you name it . . . there’s nothing more spellbinding than what Darryl was able to do in a play that lasted for less than ten seconds and resulted in six points for his beloved Mustangs. Westbrook, Sanders and Jones can feel free to stop reading here, because I have nothing of value for them. As for the rest of us, what I am going to give you is my recipe for speed training and how I break it down. This is a blueprint that I use to develop my kids and, over time, how my teams become the fastest teams in the country. We will never win with size, because my coaching staffs don’t recruit size. We will beat teams because we are light years faster than our opponents and we are in a completely different stratosphere from a conditioning standpoint. My football team has a very important season coming, one game in particular, and we are going to field a product that no one has ever seen before. Speed everywhere and a level of “go” that will not be matched. You had better out scheme us, because if you plan on winning with physicality, you’ve already lost. The ability to accelerate, decelerate, redirect and then accelerate again; It’s that X factor quality that most laypeople correlate with athleticism. I’ve read a ton of phooey from people in places of power within the industry who claim it can’t be taught. You know, those publicly crowned authorities who think the work we real coaches put in is done in vain. What they are saying, in actuality, is that they don’t know how to coach it. As for the rest of us, it’s a labor of love. It’s my baby. I’m known for kettlebells and I know I’m a good kettlebell coach. But, the weight room stuff is easy. It’s the outside stuff where championships are won. That is where I truly shine. Being hyper-efficient and organizing the body during the turn is not inherent. It’s complicated, and like I said earlier, multiple things must happen in order for there to be a successful turn. The idea is, an athlete could be in a full sprint, rapidly decelerate, redirect and then accelerate again, without losing a ton of speed. Unfortunately, most athletes have never been taught how to do this and nearly 100% of my incoming athletes do not naturally do this efficiently. Go! Body position (particularly spinal position), shin angle and foot contact determine how fast you are out of the gate. The front of the foot is for acceleration, the heel is intended for deceleration and breaking. If you violate those laws by flipping them, you will never be fast. Period. When accelerating, the drive phase of foot to ground should be centered behind the fourth and fifth metatarsal before the foot resolves itself by subtly rolling midline and eventually resolving itself and slung off of the big toe. Shin angles need to be fundamentally pointing in the direction the athletes want to go. If you are too upright, the shin angle begins to be more up and down versus angled forward to shove the athlete forward. As you have been reading and seeing with the work I’ve been doing with David Weck, and Chris White, the head must be over the floating foot before the foot strikes the ground to ensure tensional balance and the athlete centering his/her mass over the primary contact point. This Head Over Foot™ technique originates from the spine going into lateral flexion followed by the shoulder dropping down and back as the hip moves up and forward. This is what we are actually seeing when we look at arm drive in a speed athlete. The “arms” in sprinting are not just arms and shoulders. What you are actually seeing is the lats driving the upper body’s contributions to speed. It’s organization, grace and power displayed in a singular step. You’ve worked yourself into a ton of forward, linear-based speed and suddenly need to redirect. The first obstacle is managing your breaking down approach. Every good athlete uses the few deceleration steps to cheat into the turn that is going to be completed. Knowing that you need to initiate the turn in the slowdown is where many athletes gain a positional advantage with their opponent. They begin to rotate their bodies in the desired direction during the few steps to decelerate. Essentially, they have completed 40-60% of their turn before the “turn” has even happened. As stated above, the heels are the braking force for the athlete. Momentum, surface conditions and footwear all play a major role in what the athlete needs to do to successfully stop. Where nearly all of my athletes get into trouble is they rely on their forefoot to stop them. Structurally, the forefoot is built to create a sling shot effect from the drive phase of acceleration. That same ‘play’ in the forefoot does not have the structural integrity to stop large degrees of momentum. The heels, on the other hand, are directly in line with the long bones of the lower leg, where foundation lives. Decelerating is about the heels and stealing rotation while decelerating. The athlete who tries to accelerate off of his inside foot is a dead man. Outside and inside are determined by where you are in space, and where you want to go. If I am turning to my right, by virtue of position, my left foot becomes my outside foot and my right foot is my inside foot. I see tons of athletes who try to use the inside foot to “pull themselves” into the new direction. In every case (except with Westbrook, Sanders and Jones) the end result is slow, off balance and leaves the athlete in a vulnerable position. I tell my big guys, my linemen, “If you find yourself in this position on the football field, I’ll be the first one to apologize to your mothers when we are carting you off in the ambulance.” If I was an offensive line coach, I’d sit and spend a day watching game film of their opponent looking for linebackers who have a tendency to get on their inside leg . . . I’d then instruct my guys on timing and how to bait this so we could spend the evening de-cleating him. If we were to freeze frame the nanosecond where the athlete comes to a complete stop, we would take an aerial picture from directly overhead and evaluate where their feet are in space. Take the same right turn example, in this freeze frame, what we need to see is an outside foot that is subtly in front of the inside foot. Many athletes find themselves in a switched foot position which creates problems for them entering into the new line. In order for the turn to be directional and fast, the outside foot must land in front of the inside foot (two inches or so). The heel lifts with the drive happening on the outside foot’s fourth and fifth metatarsal and the inside foot lifting and taking an exact directional step (short in nature). This allows the hip of the outside leg to clear the position of the inside leg, and directionality to ensue. If you have this reversed, and the outside foot is behind the inside, one of two things must happen. You either have to swing the gate open, taking a step with the inside leg that goes nowhere, or you have to step around yourself. Both are slow, and both are unathletic. I can evaluate an athlete in one step and tell you if he or she is a good athlete by simply identifying how organize their feet in deceleration. I learned this very valuable lesson, not on the field, but in a martial arts class. I studied baguazhang with the greatest living bagua master in the US, Dr. Jerry Alan Johnson. Bagua is about coiling and dismantling your opponent. “I’m going to remove your eyes or dislocate your shoulder or knee before I go to work on you.” It’s beautiful and grotesque all in the same breath. The key in bagua is owning our ability to coil. Coil your spine, coil your hips and legs, coil your arms and upper back. When done properly, what appears to be like a structural disadvantage become a structural advantage, if you know what you are doing. We are all used to using weight room bracing to stabilize the spine in a neutral position. It’s considered strong, safe and is thought to facilitate the expression of power to the limbs due to the braced, neutral position. Bagua taught me how to rotate and coil, and even though my hips are pointed one direction yet my upper body is pointed in the nearly the exact opposite direction, I am still braced. The discs, the facets and the spinal cord itself are all braced in this position because it is trained. What you get is a killing machine who is always in a position of strength. Applying this to turning is where we see many of my more unathletic kids find their grace. In the instant the athlete comes to that stop point, and initiates the redirect, the athlete throws his/her head and eyes to their desired location. This facilitates three major points that entirely missed by most speed coaches. First, the snapping of the head and eyes create a neurological trigger within the inner ear that gives the body the impulse to turn. It’s a technique used to tap into the deep ancestral, DNA level of being a bipedal. The second huge advantage of coaching this (and coaching it well) is that it lessens the workload of the hips and legs. The lumbering, oaf-like runners, use their legs to turn the entire body. If you take a person my size, 6’2” and 300lbs, if my legs and hips are responsible for turning my entire frame every time I turn, the cumulative energy cost will drain that athlete long before the game is over. If I use my head and eyes, the natural coiling that occurs from the head and eyes whipping in position turns my shoulders. So my 300lb frame is now more like a 150-200lb frame to my legs and hips. Energy conservation at its finest. The last benefit of coaching this is the head and eyes put the spine into coil where the Head Over Foot™ technique can be utilized. In our above example of the right turn, once the head and eyes whip into position, the lifting right foot floats as the head centers itself over it. This creates the tensional balance that is necessary for centered, graceful running. Once out of the turn, the acceleration phase begins again and the cycle repeats. I know this seems incredibly complex. But what it really is refined attention to detail. Most of my kids appear to be faster than they really are. 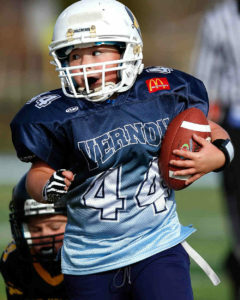 In a 40, for example, many of my kids might not turn out head spinning times, yet on the field, they look like world beaters. It’s because they don’t waste steps. We win with speed because we run well, not because we are naturally fast. 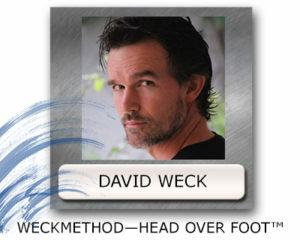 This piece, along with others, is part of a collective we are creating in support of David Weck’s work with the Head Over Foot™ technique. Please keep following over the next few months and we continue to deconstruct this revolutionary way of training speed.